Whether you are after a Service dog, Therapy dog or Emotional Support dog, any working dog needs 3 components to function and serve the needs you have, successfully: Basic and Advanced Manners, Task Training and Environmental Proofing. There are no short cuts or quick formula’s, dogs need to experience as much as possible while in training and this takes time, proofing and testing. 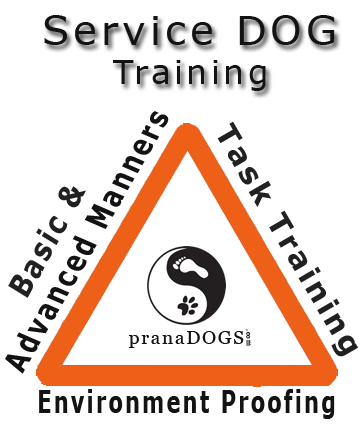 At pranaDOGS we celebrate the public’s love and desire to have their dogs accompany them everywhere, but want to ensure dogs have the skills (and coping mechanisms) to handle the unpredictable nature of people and the environment. We provide Free and low-cost Service Dog Workshops, group classes and private training for individuals with dogs who are good candidates for this type of work. Additionally, we identify, foster and train shelter dogs to work as psychiatric service dogs specifically to assist people through post traumatic stress disorder. Can your Dog be a Service Dog? A service dog is a dog who has been specially trained to perform certain tasks which provide their caregiver with the freedom and independence necessary to function in society. What does a service dog do? It depends on what they've been trained to do. Service dogs can be trained for particular jobs, particular disabilities or particular people. Where is a service dog allowed? A trained service dog is allowed anywhere their caregiver is allowed: full access. Restrictions on dogs in training are on a state-by-state basis. Do service dogs have to wear a vest? No. Service dogs do not need to wear a vest. How are service dogs trained? It depends on what jobs they're being trained to preform. The majority of service dog training is done using positive-reinforcement methods. 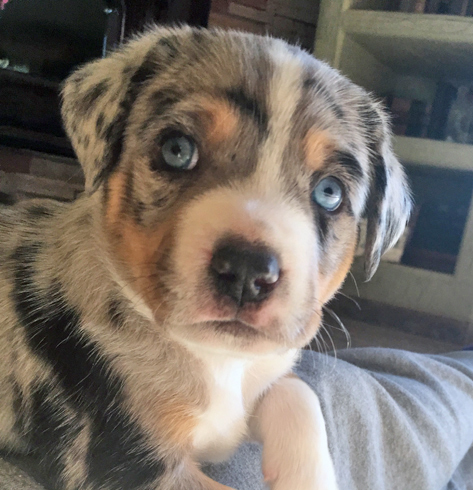 Training involves multiple parts: basic and advanced manners, task training and environmental training (getting the dog acclimated to as many things as possible). What happens to service dogs after they retire? Service dogs are pets when they're not working. As such they retire with their lifelong caregivers and typically can live out their days with them. Some service dog placement organizations require that the service dog be the only dog in the household; if this is the case the retired dog is typically placed with another family member. How much is a service dog? It typically depends on the number of tasks they know and the organization you're adopting from. For years service dogs were $20,000-$30,000 and in many cases still are. But today there are multiple organizations that adopt out service dogs for free or for a much reduced cost by utilizing other revenue streams. Where do you get service dogs? Try looking close to home to see if there are trainers in your region. 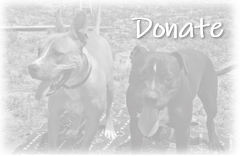 Adopting a dog from a trainer close by gives you access to onsite training and problem solving. ADI - Assistance Dogs International has a stringent certification process which many trainers use as the benchmark in service dog training. What are psychiatric service dogs? Who can get a psychiatric service dog? Individuals who's doctors agree that a service dog would give them additional freedom and independence. Some organizations require the caregiver to be able to manage the dog themselves while other organizations will allow a 3rd party to manage the dog. Are there service, therapy or emotional support cats? The only animals who can be service animals are dogs and miniature horses. The same is true for emotional support animals. Many different species of animals have been trained and are being used as therapy animals. What is the difference between a therapy dog, a service dog and an emotional support dog? Therapy animals - are used in hospitals, nursing homes, airports, etc to bring joy and relaxation to people. These animals only have authority to be in the areas they've been approved for. Emotional Support animals - by law these animals don't need specific training but they also don't enjoy any of the benefits of the other working animals. They are typically only allowed in subsidized housing. Service dogs are afforded complete access and are specialty trained. Take a second to fill out the form below. The more information you can provide the better. We'll be in touch within 72 hours. Tell me more, including: name, age, and breed of your dog. Male or Female? Altered? How long has the issue been going on? Any other issues that you've been experiencing? The more thorough you can be in an email, the better we can focus our time together!